For a while we've been selling fizzing butter melts in our luxurious bathing hampers. These have proved to be so popular, that we've given in to customer demand and will now be offering these as individual bathing items! These lovely fizzy bathing melts contain generous amounts of organic shea and cocoa butters, and they've been designed to gently fizz and melt in hot bath water. Every fizzing bath melt is made by hand, only contains natural ingredients and aromatherapy grade essential oils, and is rolled in petals or decorated with pretty botanicals. These are very moisturising bathing products, and are heavier than some similar items we have seen and do not contain any synthetic detergents, making them a more natural choice and better value for money. It's best if you pat yourself dry after taking your bath to allow the botanical butters and essential oils to sink into the skin, making them a good choice for dry or troubled skin conditions. Many of our regular customers love the fact that they do not need to apply any body lotion after taking their bath. We'd suggest that you take care when using fizzing bath melts, since they can make the bath surface slippery. 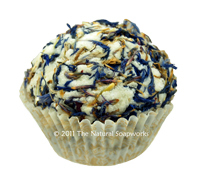 They are fabulous as a relaxing bathing treat, and are individually packaged making them great as small gifts for friends and family! Base ingredients: Sodium bicarbonate, citric acid, organic shea butter, organic cocoa butter, apricot kernel oil, petals and botanicals, and fragrances derived entirely from aromatherapy grade essential oils. 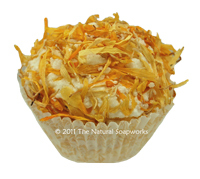 This is a gentle fizzing bath melt that has been rolled in golden calendula petals, with an aromatherapy blend that includes chamomile roman and lavender. This blend is particularly suited to anyone who has sensitive skin. Each bath melt weighs at least 35g and is presented in a cellophane bag. This is a soothing fizzing bath melt that has been rolled in jasmine and larrkspur petals, and is delicately fragranced with a blend that includes ylang ylang, frankincense and bergamot. 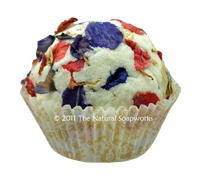 This is a lovely sweet bath melt, that's lovely to use at the end of a long day. Each bath melt weighs at least 35g and is presented in a cellophane bag. 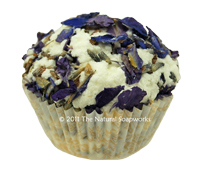 This is a lovely bath melt that's been rolled in cornflower petals, and is fragranced with the most relaxing essential oils including lavender, ylang ylang and bergamot. 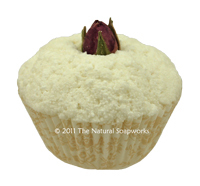 We think this bath melt would be lovely to use just before going to bed. Each bath melt weighs at least 35g and is presented in a cellophane bag. This is a beautiful fizzing bath melt decorated with a pretty pink rose bud, and containing a floral blend of essential oils including rosewood, rose otto and geranium. This melt is a favourite due to it's lovely floral fragrance, and suits those who prefer not to bathe with lots of petals. Each bath melt weighs at least 35g and is presented in a cellophane bag. 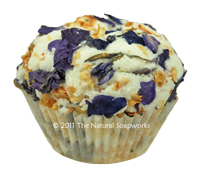 This is a gentle and relaxing fizzing bath melt rolled in lavender buds and larkspur, that has a soothing blend that includes lavender and geranium essential oils. This is another bath melt that we'd recommend for use at the end of the day, or at times when you need to relax and unwind. Each bath melt weighs at least 35g and is presented in a cellophane bag. 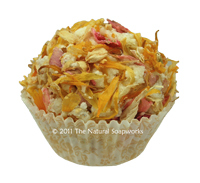 This is a gorgeous uplifting fizzing bath melt rolled in calendula, rose and jasmine petals, this has a sweet, bright aroma that comes from citrus essential oils and includes grapefruit and lime. We think this melt is lovely to use in the morning, or perhaps for those times when you need a little lift. Each bath melt weighs at least 35g and is presented in a cellophane bag. This is a sophisticated blend of citrus and floral fragrance notes with luxurious frankincense for a really special bath. This fizzing bath melt was designed to compliment our Peace Aromatherapy Rollerball blend, and would be lovely to use when soothing emotional calm is needed. This blend is particularly suited for use during pregnancy, and features a very pretty design of ivory, pale pink and blue petals. Each bath melt weighs at least 35g and is presented in a cellophane bag. This is a sensuous blend which is sweet, but has depth due to the lovely balance of luxurious jasmine, ylang ylang and patchouli within the blend. 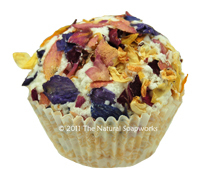 Perhaps one of our prettiest fizzing bath melts, Exotic Flowers is hand rolled in a mixture of yellow, ivory, pink and blue petals. Each bath melt weighs at least 35g and is presented in a cellophane bag.